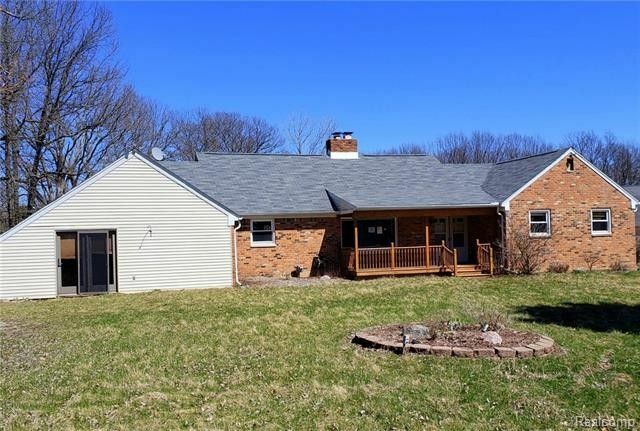 This sprawling brick ranch sits on a scenic and beautiful 9.79 acres of land!! Upon entry to the home you'll find your living room leading to your formal dining room that leads to your spacious kitchen that features plenty of cabinet and counter space! Through the hallway you'll find your wet bar area with a brick wall fireplace, family room and sliding glass door wall leading to your huge enclosed porch!! In total this home features 4 bedrooms 2 full bathrooms and one half bathroom! This home has the space, rooms and land that you need! This is a VA owned property. This property may qualify for Seller Financing (Vendee). No offers will be reviewed until the home is on the market 3 full days per Seller.